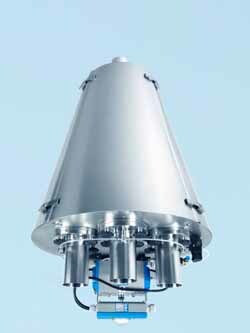 It all started with the introduction of the M-TDV multi-port tube type diverter in 2000. For this diverter DMN looked at the options to have a pneumatic mechanical drive or an electrical drive. The choice was for the latter, due to simplicity of construction, minimum wear parts and precision positioning. DMN already has a two-way tube type diverter, which has been in its product offering since 1996 and was due for re-evaluation with regard to the requirements of today. It was thus decided to design and produce a 2- and 3-way diverter of similar construction to the M-TDV. The M-TDV is available with up to 24 ports on the smaller pipe sizes; therefore the new 2- and 3-TDV seamlessly connect with the M-TDV range. Contrary to the M-TDV, both the new 2- and 3-TDV are activated using a pneumatic actuator, due to cost considerations. This gives a very compact design to both diverters and by using an additional line cylinder on the 3-TDV very accurate positioning is achieved. The uniquely designed seal that has already been proven on the M-TDV is also being used on the new 2- and 3-TDV. This seal is made from EPDM and is very easy to fit and clean, and being inflatable guarantees absolutely tight sealing in the conveying line up to 3-bar g. (higher on request) This also applies to liquids. The whole range of tube diverters (2-, 3- and M-TDV) are of a sanitary design and have stainless steel AISI 316 product contact parts with a multiple choice of line connections, ranging from a simple pipe connection to a milk coupling. 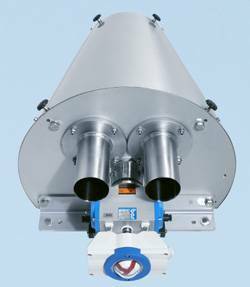 The swan neck pipe connecting the inlet to outlets is designed to give minimum product degradation in every conveying direction. All conveying lines that are not in use are also sealed at the diverter outlet. This ensures that there is no air or product leakage from destinations that are not being used. The diverters are designed to be easily removed from the line for cleaning (COP – cleaning out op place). It is also possible to purge the individual conveying lines with a cleaning liquid without removing the diverter from the line (CIP – cleaning in place). Removal from the line is only necessary when a complete cleaning operation is required. This gives the customer the option to choose a cleaning method tailored to suit their process. There will also be a very competitive 2-TDV 1 bar hybrid design available, constructed out of aluminium and stainless steel, having all product contact parts made from stainless steel and using a static silicon seal instead of the inflatable EPDM. DMN-WESTINGHOUSE has been designing and manufacturing rotary valves, diverter valves and other related components for the bulk solids industry for more than 40 years, offering tailor made solutions for the mineral, chemical, food, plastics, pharmaceutical and other industries, DMN products are distributed worldwide. Besides an extensive range of standard components, they also supply components conforming to USDA requirements and pressure shock resistant up to 10 bar as well as ATEX compliant to Directive 94/9/EC, including for use with ST2 rated powders. DMN Westinghouse are exclusively represented in Australia and New Zealand by NTR Engineers Pty Ltd.